A Testing Center of Excellence (TCoE) is a centralized unit comprising testing processes, people, tools that operate as shared services in order to provide testing services with optimal benefits across the test organization. TCoE accrues many benefits to an organization in terms of improved quality, lesser time to market and lower cost of ownership. Organizations today are facing challenges in maintaining application/product quality, underperforming testing functions, suboptimal utilization of people, tools, infrastructure, and inconsistent test processes across locations. Setting up a TCoE creates a centralized testing function, helps achieve improved efficiency, optimizes people/tool utilization, and reduces testing costs. Implementing the recommendations by a TCoE expert enables enterprises to build an efficient, dynamic, and lean testing function. Cigniti’s TCoE Services have consistently met and exceeded the needs of enterprises, ISVs across the verticals. 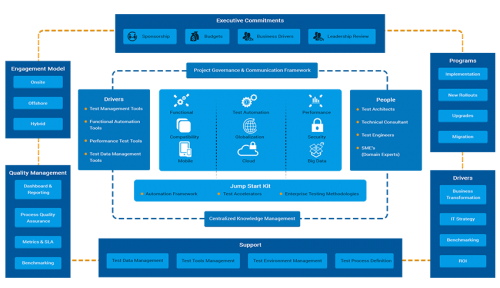 Cigniti’s TCoE Framework (SCALE) is designed to provide a holistic and integrated way to achieve excellence for a testing organization or unit. The proprietary framework consists of core elements addressing all aspects of an organization. Executive Commitments: The Executive Management takes the responsibility for the success of TCoE by conducting regular leadership review meetings. It ensures that budgets are allocated, goals and objectives are defined for the testing organization. Drivers: Drivers aid in the effective implementation of all the IT processes and procedures by enabling business transformation, benchmarking performance of test organization for optimum ROIs. 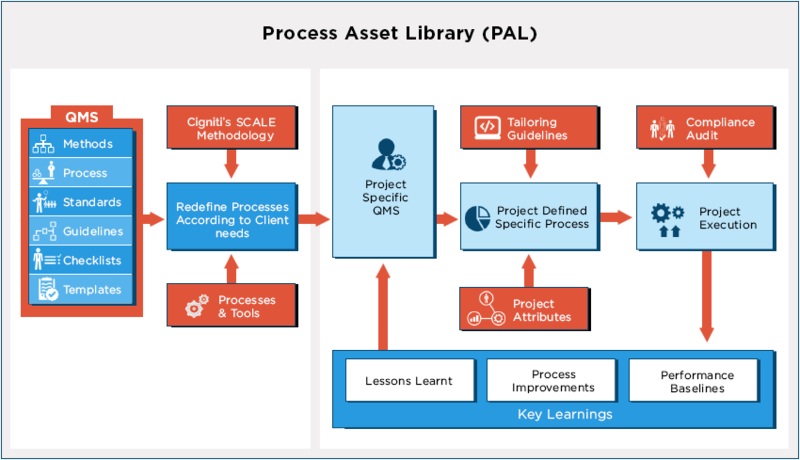 Jumpstart Kit: The jumpstart kit accelerates initial setup time of TCoE by providing customized frameworks for enhancing productivity and/or reducing process cycle time. The accelerator kit consists of a Process Asset Library (PAL) that contains over 500 highly proven customizable assets such as guidelines, templates, checklists & standards that can be easily deployed for standardization. At Cigniti, we have established Software Testing Centers of Excellence around Mobile, Performance, and Security Testing. We have set up dedicated labs within the organization which our clients leverage for gaining maximum benefit from their QA investment. We are powered by the strong strategic partnerships with leading test tool vendors and our test professionals have profound expertise in handling various commercial and open-source testing tools. In addition to partnerships with AppDynamics, Experitest, Neotys, Ranorex, and TestPlant and more. We also are HP Service Provider Partners (SPP). Cigniti’s unique TCoE services combine the deep understanding of industry best practices and decade long expertise in software testing services delivery. Our TCoE Services are unique as we not only take up the end-to-end QA ownership but also provide complimentary testing R&D expertise in the form of IP and test accelerators. To handle sporadic service demand, we also provide ‘Shared Pool’ model of engagement. Cigniti’s ability to set up cross-functional TCoE in business organizations removes redundancies and streamlines testing processes and hence accelerates the entire software testing life cycle. Here are a few of the leading businesses who have taken advantage of Cigniti’s SCALE framework for setting up efficient TCoEs. IT organizations looking to improve their testing practices often opt to centralize some or all test-related activities in a Testing Center of Excellence (COE).